I found the pencil work for the above comic page in a drawer, lost and forgotten for four years. Since I've been especially enjoying painting lately, I decided to ink and color it. It started when I quit smoking about a year ago... The ambient smells of the world, previously muted and subtle, began to scream up my nostrils. Cedars' sap, lavender's aura, the sweat of that guy ahead of me in line at the grocery store, that dumpster again. The world suddenly smelt interesting (always) and terrible (often). And boy, was I anxious. I turned to the study of essential oils and aromatherapy, and replaced the long hours spent smoking with luxurious salt baths. Now, according to my 'quit smoking' app, I haven't smoked a cigarette for 500,684 minutes. Tick, tick... who's counting? I've learned a lot about essential oils in the process of dropping that bad but compelling habit. For awhile, I hid away in my house, all diffusers blaring. I dog-eared the Valerie Ann Worwood's usually grounded, occasionally flighty classic: The Complete Book of Essential Oils and Aromatherapy. That was me in the apothecary with three droppers to my nose. Let yourself be reeled in by the siren song. This alluring blend of essential oils and the salts of three seas makes for a bathing experience like no other. Handcrafted in Portland Oregon, sourced from the best of the world. This soothing, exfoliating blend will get you in the mood for for life, love, and all the rest. 8 ounces. I just got back from an artist residency at the Sou'wester, a sweet resort comprised of cabins, vintage travel trailers, and an historic lodge in Seaview, Washington. I went with the goal of creating a little guide to bicycling the Discovery Trail; this multi-use path twists through the dunes, the headlands, and the coastal forests of the Long Beach Peninsula. What a great week spent bookmaking and staring at the surf! Every morning, I rode my bike down the winding trail, thinking about the history of the land, watching the changeable weather, listening to the frogs hop and the snowy plovers skitter, smelling the sea spray, mapmaking, and plotting how to share this path I love in a little handmade pamphlet. Thank you, Sou'wester, for this chance to focus on creating a little document about an amazing place. Bicycling the Discovery Trail by Sandra Gibbons, hand-sewn pamphlet on parchment papers, 12p, fold-out map. Shown on cute table in Sou'wester's Cabin #10. Clark's Jaunt, in Statues and Bones. The Discovery Trail marks the spot where Lewis and Clark turned around. They didn't "discover" anything (of course), but there are some cool statues peeking out the the Dunes to commemorate the expedition. Tides, Winds, Time. The ocean near the mouth of the Columbia River is notoriously rough and known for shipwrecks. Haunted(?) Beach Towns. Long Beach and Seaview, with their long histories and abundance of memorial benches, are likely haunted. 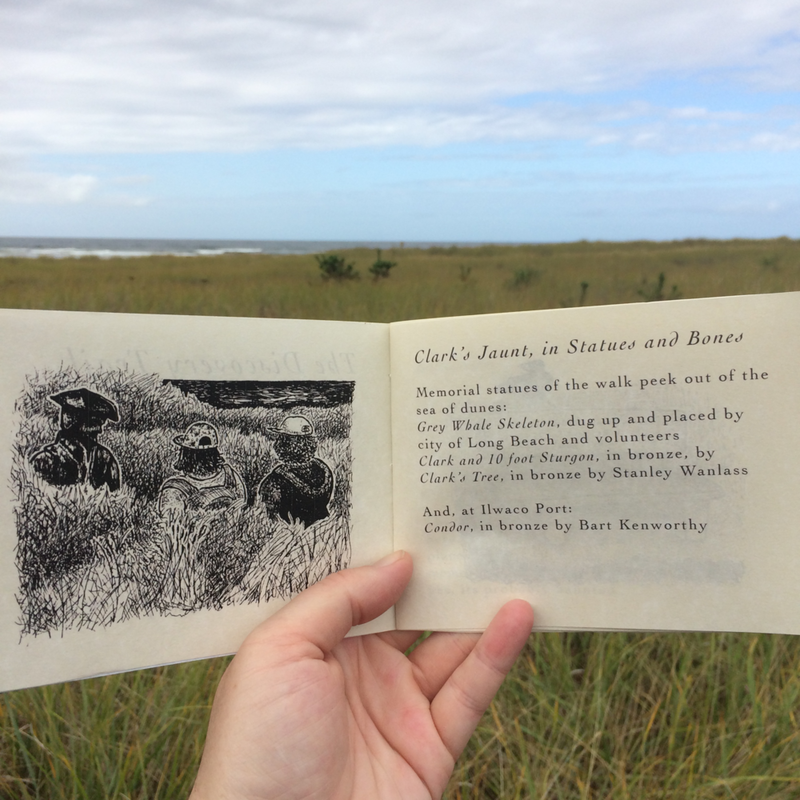 Head to Long Beach Peninsula, visit the Sou'wester, and get a copy of this pamphlet at their utterly charming Honor Store. Then, hit the trail! Image description: A spread of an illustration and a poem. The image features a person holding a cat. Their right wrist is flexed downward, and their left thumb is seemingly tucked in their fist. The poem reads as follows: Lessons of touch. A cat burrowed between my two sweaters, the first lesson of touch comes to me at seven on the drive home from the humane society. I twitch – of course I twitch – my shoulder jumps. So the cat moves and kneads a new spot between my sweaters, settling again – and again with the next spasm. This is how it is, how it's going to be, the simplest understanding. And soon we're asleep with each other, reconciled and warm and still. We invite disabled poets to contribute their meaning and magic to the collection, Body Politic: Illustrated poems about the body and disability. Logo for Tender Buttons: OBJECTS and interior shot of the Beinecke Rare Book & Manuscript Library. Photo credit: Beinecke Digital Studio. I'm excited to announce that high-resolution digital reproductions of my project Tender Buttons: OBJECTS are now available to view and download, for free, from the Beinecke Rare Book & Manuscript Library at Yale University. View the digital collection. This library is the perfect home for this series, as their collections include many of Gertrude Stein's and Alice B. Toklas's manuscripts, letters, photographs, printed materials, personal papers, art, and objects. It's an honor to have my comics there; I hope they can shed new light on a difficult and interesting writer. The drawings are available to view by the public, if you happen to be in New Haven. If not, the scans by the library staff are really exquisite. You can see the grain of the paper, the texture of the media, and every little fingernail indentation. Thank you, Beinecke Rare Book & Manuscript Library staff. Gertrude Stein and Alice B. Toklas at dinner party; drawing comprised of various archival photos of the couple and their circle. From Tender Buttons: OBJECTS. And, thank you, David Abel of Passages Bookshop, for making this happen! I might be a hundred years too late to join Gertrude Stein's Parisian circle, but the one I have in Portland is really amazing. Do stop at Passages Bookshop if in Portland.